The FreeGarden" RAIN 55 gallon Black rain barrel is designed with the homeowner/gardener in mind; affordable, attractive, easy to move, easy to install, and easy to use. With as many as three bins easily fitting in the back seat of a regular sedan, the average buyer doesn't need to arrange special transport. The barrel's square shape is ideal for attractive flush to wall and corner installations. The tall spigot placement accommodates most watering cans, and four additional spigot mount points are provided lower on the barrel. Manufactured with a maximum of recycled content (varying by colour option), the FreeGarden" RAIN contains enough virgin resin to ensure optimal product durability and lifespan. Flat Back 50 USG Rain Barrel with Brass Spigot in Mud Embrace nature's solution to our emerging water shortage-collect rainwater! Our authentic oak barrel texture is moulded into each barrel and will not fade, rot or risk insect infestation. 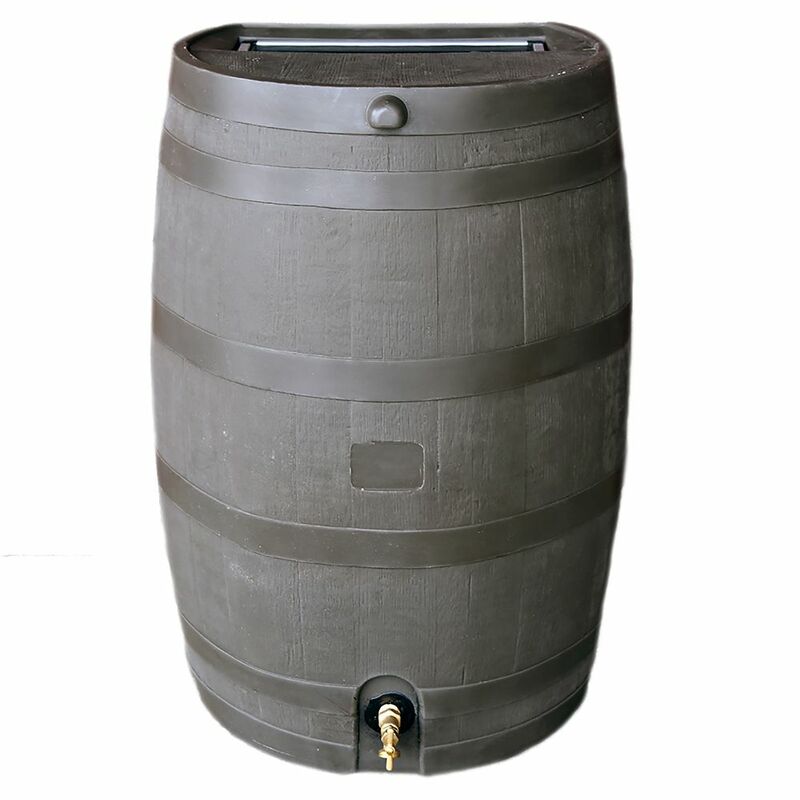 Flat Back 50 USG Rain Barrel with Brass Spigot in Mud is rated 4.1 out of 5 by 527. Rated 4 out of 5 by Rainbarrel from Easy set-up and durable. Easy set-up and durable. Rated 5 out of 5 by Wayne from Easy to assemble. Works great. ... Easy to assemble. Works great. Rated 5 out of 5 by Linda from Easy to install and seems to have caught the rain... Easy to install and seems to have caught the rain so far. Now I’m just hoping to get my rebate! Rated 3 out of 5 by unhappy67 from The rain barrel itself is fine. Purchased the brass spigot instead of the plastic, but it inser... The rain barrel itself is fine. Purchased the brass spigot instead of the plastic, but it inserts into a plastic plece which does not fit properly. It leaks. Purchased this on-line, picked it up at the store and now have to take it back. My recommendation is do not purchase this product due to the spigot. Received no satisfaction from the store. Rated 4 out of 5 by Desertwind from Easy assembly.... Easy assembly. Rated 3 out of 5 by DontcallmeFrancis from The rain barrel is sturdy. It has the shape I... The rain barrel is sturdy. It has the shape I was looking for and it matches the color of my hot tub. The spigot threads are a little fragile even after adding plumbing tape. Its one of those situations where you'd like to tighten more but I'm nervous about damaging the threads themselves. It works. What kind of plastic is this made of? Is it BPA free? I want to use it for drinking water. I contacted the company, and they said yes, all of their rain barrels are BPA free.